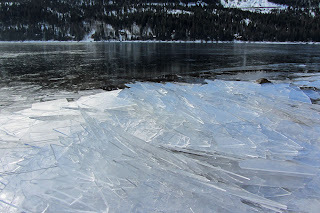 Ice on Prosser Creek Reservoir, Truckee. 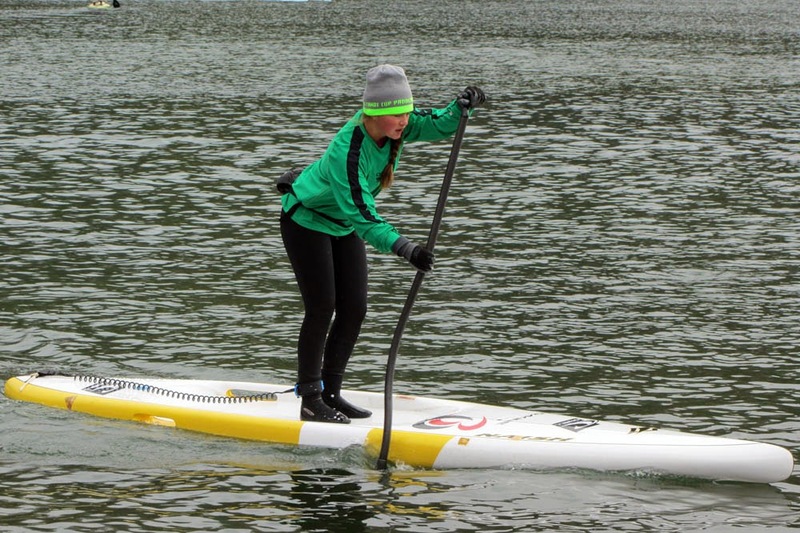 Getting out on the water in the fall and winter can be mentally challenging. Who wants to be out on the cold water and feel cold? 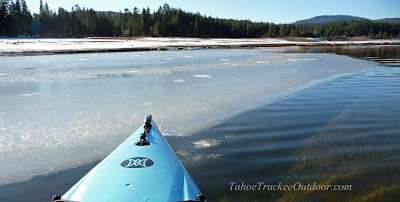 However, if you are properly dressed, cold weather paddlers can be treated to unique views and amazingly tranquil waters in complete comfort. Staying warm before you launch is important, so put the boat/paddle board on the car the night before or keep warm while you load-up that morning. If your hands or feet get cold before you launch, you may be in for some discomfort. Get warm in the car before you launch. I like to dress like a cross-country skier. Dress in layers with breathable clothing that wicks moisture away from the skin. You must wear a hat and keep your ears warm as well. Gloves are a must. Full fingered leather cross-country gloves work well down to around 25 degrees for me. Lower temperatures require traditional downhill ski gloves. When paddling a kayak, I like to drape a waterproof jacket over my legs to keep them dry. Pocket hand warmers are nice to slip inside your gloves, socks, pockets, or between layers of clothing. Paddle boarders should wear high-top surfing booties to keep their feet warm. Properly dressed for a cold morning on Donner Lake. The main cold water problem is keeping your feet dry when launching. 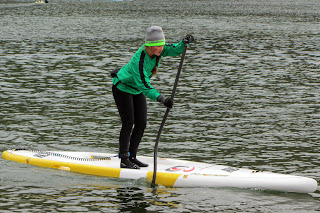 If you have a dock, paddle boards can be easily boarded without getting your feet wet. Kayaks and canoes aren't so easy to launch from a dock. If you decide to let your feet get wet, you should wear surfing booties to keep them warm. Launch and recover your boat with cheap knee high rubber boots that you can slip off once seated and before you tuck your legs inside. When you get ready to exit the boat you can slip the boots back on before stepping into the water. The boots can be stowed or tied down to the boat when underway. I wear heavy wool socks under the rubber boots. If the boat stays dry, your feet stay dry. A dry-bag provides a place for additional clothing or the clothing you choose to shed. Bring a camera and put the camera in the dry-bag until you are underway. Lake Tahoe is too big for my cold weather paddling preference. 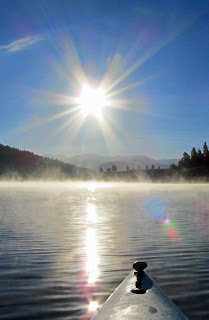 The smaller lakes are more likely to have calm water, morning fog, waterfowl, and ice. I like Donner Lake, Boca Reservoir, and Prosser Creek Reservoir. Donner Lake has the best winter access. The cold water can be quite debilitating in a very short time. These trips are best taken with a friend. Let someone else know where you are going and when you will be back. Staying within a short swim distance to the shore is good common sense as well. Leave a set of dry clothes in the car for you or someone else.